Here is a low-mess and cheap activity that has quickly become a favourite for Thomas, an idea I got from pinterest. When he wants to play with the play-dough, I sometimes give him a few pieces of uncooked spaghetti and a small cup of cheerio's. 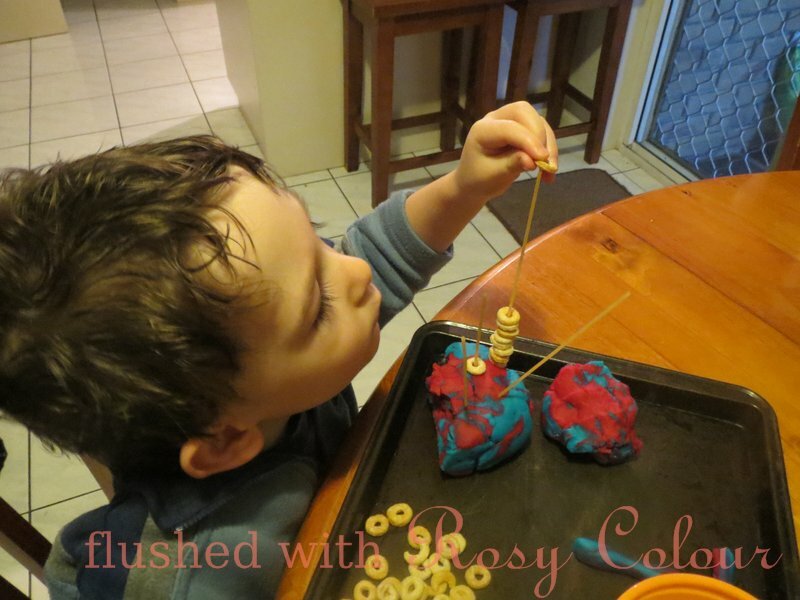 I then encourage him to thread the cheerio's onto the spaghetti sticking up out of the play-dough. This is a great fine-motor activity, perfect for developing hand-eye coordination and finger control in preparedness for learning to write. Play-dough like this lasts well for a month in the fridge. This photo was taken a couple of weeks ago, the formally pink and blue play-dough is now a deep rich shade of purple!